Last year, we were reminded that users are powerful. Not only do online marketers influence their target audience, users also have the power to influence the digital advertising industry. Major topics from last year included GDPR and Google’s initiative, Coalition for Better Ads. In an effort to promote transparency, Google’s initiative was made to avoid ad blocking while GDPR protects data from users. Additionally, we’ve previously mentioned that brand use of creative campaigns and powerfully-captivating content draws positive user engagement. However, despite the status quo, brand safety also tacks itself onto this checklist of marketers to follow. Let us have a look at why. Branding holds more power than ever. How your brand appears and communicates its message to your target audience goes beyond its content. Where you place your ads influences a user impression as well; which web pages can we find your campaigns on? Quality campaign or content appearance itself is not enough anymore. Users are now quick to decide on whether or not they trust a brand based on its placement. Online marketers not only need to focus on powerful branded content, but also the prevention of risked branding. Thus, this year, we all need to better understand and look out for the trend of brand safety. What is the content’s tone? High-quality content and positive or neutral environments have sparked a new challenge for brands across the board. According to a collaborative study called “The Brand Safety Effect” from Magna, they found that ads appearing near negative content result in a “2.8x reduction in consumers’ intent to associate with these brands.” Among the 2,000 consumers surveyed, brands that are visually found in a negative online environment fall victim to the likelihood of consumption from users. An example of such an environment could be a Burger Joint brand placing a campaign within a content piece that advocates healthy eating. Although the brand surrounding burgers and fast food may be popular among other appropriate audiences, its campaign placement within a topic that associates fast food as unhealthy and “negative” could potentially place the burger joint brand at risk for a bad reputation. What is Brand Safety, and why is it important? Number 13 is a relevant category that IAB includes. 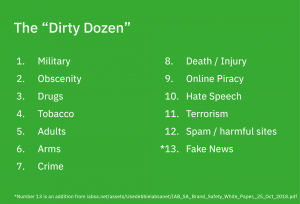 Web pages or content related to these categories put brands at risk; users may associate a brand with any Dirty Dozen classification. The tone and topic to which your campaign is located on affects your brand and ultimately any consumer opportunities. From Magna’s survey, brand safety may result from consumers’ feelings or impressions of encountering brands within a negative environment. Interesting findings from the study reveal that consumers are 4.5x more likely to feel that a brand does not care about them and that consumers’ brand quality perception drops down 7x more. Thus, it is imperative for action to be seriously taken on brand safety in order to avoid an initially-negative perception. Who is responsible for brand safety, and how can a brand safety crisis be handled? Brand safety as a streamlined conscious of awareness belongs to the online marketers who communicate and strategize their brand’s message. According to a March 2018 poll from eMarketer, majority of brand marketers in Europe and the US, 38%, think that the brand is responsible for brand safety, which rightfully fits. Although other factors can affect a brand’s image- such as ad exchanges, DSPs, and media agencies- the brand should take responsibility and control of executing their message placement. As part of a holistic strategy, brands proactively reach out to users with the appropriate platforms must be considered. In case a brand’s reputation is in jeopardy, the best way to handle it is to calmly address and assess what happened. From there, you and your team can properly think of the appropriate next steps. Campaign placement leads to an automatic tone and first impression from a user. Users want to feel safe when they browse online and traverse through various online platforms. Thus, audiences who are also prospective consumers are what should empower brands to take control of their reputation. We at plista support a safe, transparent, and trustworthy internet platform for users. With our high-quality native advertising products and service, we help brands sustain their desired image by empowering them to take control of their content distribution with Editor’s Pick 2.0, their campaign placements through programmatic buying with high-quality DSPs and SSPs, and more. We turn your content into business outcomes. Are you an online marketer who is seeking to take control of your brand? Then reach out to our account managers on our contact form here. plista’s native ad formats stand out through their strong engagement character and enable advertisers to efficiently target audiences along the entire sales funnel. At the same time, thousands of premium publishers are working successfully with plista in order to achieve outstanding content monetization, increased website stickiness and sustainable traffic growth.